← Backup a database from one server and restore the same on the other server? 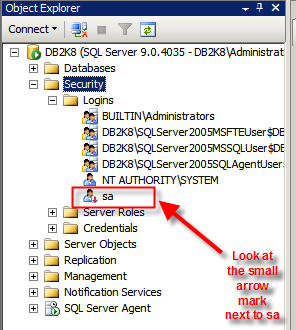 How to enable sa Account in SQL Server? When you install the SQL Server using Windows Authentication mode, by default, the “sa” account is disabled. Sometimes, due to users/customers request, you may need to enable the sa account. You need to change the authentication mode for SQL server from Windows Authentication Mode to SQL Server and Windows Authentication Mode to use the sa account. Follow the steps mentioned below to change the authentication mode from Windows Authentication to SQL Server and Windows Authentication. You need to remember that, the SQL Server service needs to restart to make this change effective. 1. 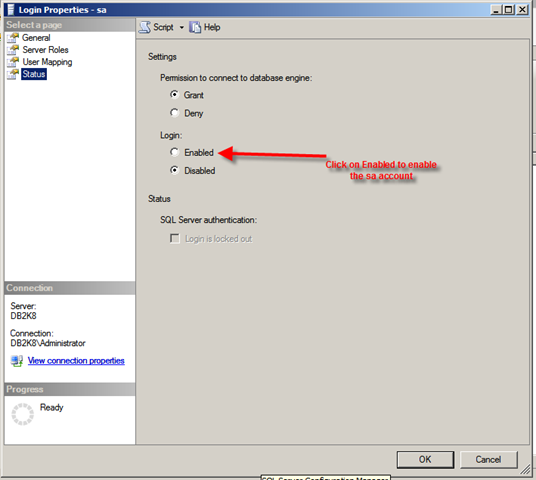 Login to the SQL server instance using SQL Server Management Studio. 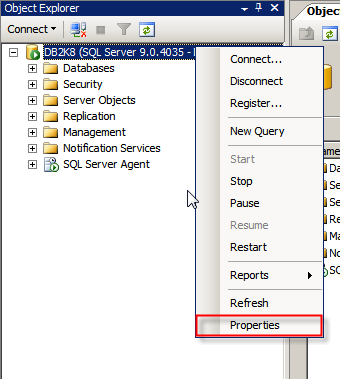 Right-click on the database instance, and go to Properties. 2. On the Server Properties page, Click on Security. Click on the radio button next to SQL Server and Windows Authentication mode, and click on OK to close the Server Properties page. As discussed earlier, we need to restart the SQL Server service to make this change effective. After restarting the SQL Server, the authentication mode will be changed to SQL Server and Windows Authentication mode. 1. Connect to the SQL Server instance using SSMS and go to Security. Expand Security, go to Logins. 2. You can see the sa account is disabled when you install SQL Server using Windows Authentication mode. 4. Click on the Status page. By default, the sa account will be disabled. Click on the Enabled button to enable the sa account. Click on Ok to close the sa Login Properties. 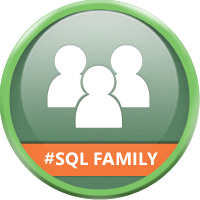 Thus, sa account is enabled and you will be able to login to the SQL instance using the sa account. This entry was posted in Security in SQL Server. Bookmark the permalink. 48 Responses to How to enable sa Account in SQL Server? Thanks , It is very usefull for me. Thanks for the help. You gave the solution in an easy to follow format. Which version of SQL Server are you using? Do you have the necessary permission on the instance? it doesnt work for me because my accoun doesnt have the right permissions 😦 and there rest of the accounts are disabled, im talking about admin, sa, and local. thanks a lot save my day…. when i put the ok Button get the error message..
how to fix this error..please help me….. Thanks a lot! I had found everything except for the last step – enable the user account. Thanks again. Thanks, it was a great help. 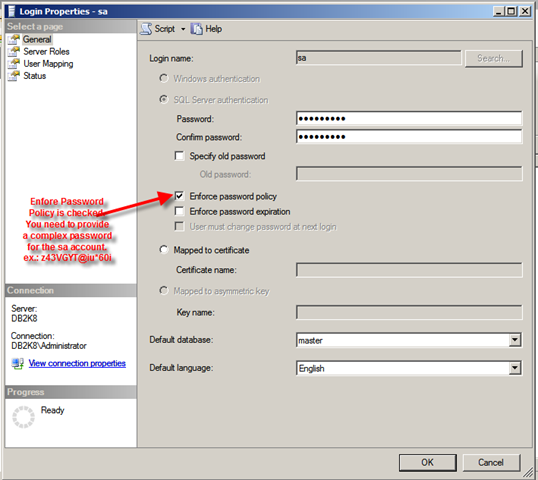 Please let me know how to enable sa account and password during silent install of sql server 2005 express. help me! I have a problem. I installed VisualStudio 2008 , and automatically also it installed SQL 2005 Express Edition. I can only join in Windows Autentication mode. The great problem is that I can’t do anything (can’t change to mixed mode, can´t enable sa user, can’t anything!).. I also try to change permissions by SQLCMD but neither. What can I do in this case?.. Thank you!! Solve my problem! it was really helpful. Many thanks for the post. Thank you! You saved the day for me! how about if the administrator account in windows authentication is also been disabled… what am gonna do w/o reinstalling the sql server. im using sql servel 2008 r2. If your server is part of a domain, your domain admin should be able to reset the local administrator password on your SQL server box.